In my previous post, I showed how the lobsters in two manuscripts by Diebold Lauber’s Alsatian workshop share specific rare properties with the VM lobsters. Even though Lauber’s crustaceans are nearly identical, they are found in manuscripts of entirely different traditions. The red lobster is from Lauber’s copy of Megenberg’s Buch der Natur (c. 1440) and the green one from Lauber’s 1438-1440 manuscript in the astronomical tradition of Michael Scotus. My conclusion was that “the next step should be to find out where Lauber got his Lobsters“. Which is precisely what we’ll attempt today. The specific manuscripts in which we found Lauber’s VM-like lobsters open up two lines of investigation. First, we must compare lobsters in earlier Michael Scotus manuscripts. And secondly, we might learn more by looking into immediate precedents for the the Buch der Natur’s illustrations. The obvious candidate is the Latin tradition of Thomas de Cantimpré’s De Naturis Rerum, of which the Buch der Natur is a German translation. It is immediately clear that Lauber used the same lobster model in his Scot as in his Megenberg. The creatures only differ in their coloring and the amount of lobes on the tail (4 vs 3). Let’s first make an inventory of the critical details of the VM lobsters that are explained and not explained by Lauber’s versions. Finally, before delving into the evidence, some important notes. This post is not about the meaning of the images, nor about the ultimate origin of the type. I am just trying to get as close as possible to the exemplars that may have been used for the VM. One might object (correctly) that the VM series is likely closer in theme to Scot’s astronomical tradition than to a Book of Nature. However, Lauber clearly shows that such imagery was not bound to one genre, and his lobster appears in both works. The cards have been dealt in such a way that I must treat Scot and Megenberg equally. As far as animal types go, I differentiate between crabs (round shape) and lobsters (elongated). Crayfish are morphologically too similar to lobsters to make a meaningful difference. When I say “lobster”, think “lobster-shaped crustaceans”. Michael Scot (Latin Scotus) was a fascinating figure. His Wiki calls him “the greatest public intellectual of his days”; as a travelling scholar, he knew Latin, Greek, Arabic and Hebrew. Several works of Aristotle, preserved in the Arab world, were made available again to the Latin West through Scot’s translations. In fact, Thomas de Cantimpré – the other author discussed in this blog post – used Scot’s fresh translation of Aristotle’s De Animalibus as a source for his De Naturis Rerum. What we are interested in here, however, is not Scot’s work itself but rather the illustrative tradition that accompanied it. A wonderful source on astronomical Lobster images is Kristen Lippincott’s Saxl Project (pdf). To get an idea of the vast variety of shapes, I would encourage the reader to go through this document and find images that explain more than Lauber’s lobsters do. I’ll wait. In the order of Lippincott’s pdf, the first lobsters that truly stand out to me are those from Pal lat 1369, a 1444 manuscript that was already flagged as potentially relevant in 1996 by Rene Zandbergen. This lobster, on the right in the picture below, postdates Lauber’s lobster (left) by a mere four years and clearly relates to it. But unlike the VM lobsters, its legs are in the right place and it’s got the correct amount of lobes at the end of the tail. It fixes the most glaring anatomical error shared by Lauber and the VM. There is no denying the relevance of Pal lat 1369 and it can’t be a coincidence that these two lobsters are so similar and appear in a similar setup (double concentric circle with red name). But on to Scot. Lippincott’s pdf then continues through a whole batch of crabs, but once we get a few pages into the Scot tradition, more lobsters start to appear. Some of the most relevant examples are found in concentric circles, indicating a common lineage. From Pal lat 1370 and Darmstadt HS 266. These examples have ten legs like the VM lobsters and are all green-grey. However, they are both dated to the third quarter of the 15th century, which means they postdate the manuscripts we’ve discussed so far. It must also be noted that the Darmstadt MS, which was made at least ten years after Lauber’s, includes the same mistake in the label: Canter. It was made in Strasbourg, so may have been influenced by Lauber’s MS, or a common source in Alsace. The Buch der Natur was originally not illustrated, so Lauber had to collect illustrations from various sources for his 1440 version. Might one of those sources have been a Cantimpré manuscript, of which the Buch der Natur was a translation? There aren’t many studies dedicated to the imagery of De Naturis Rerum, an exception being Deborah Anne Gatewood’s (2000) PhD thesis on the subject. I relied much on her work for this section. The earliest fully illustrated Cantimpré is the wonderful MS Valenciennes 320. It is believed that much of its illustrations were compiled specifically for this manuscript. Gatewood believes that there was no earlier medieval treatise on sea creatures, and the illustration of various “lesser” animals like insects and serpents only started with Valenciennes 320. So we may expect some degree of originality in its illustrations. Valenciennes 320 was written in the 1290’s, some 150 years before Lauber’s Buch der Natur, and many subsequent manuscripts were based on it. What does its lobster look like? Surely, such a foundational work did not put legs on the tail? Take a good look at that thing. It’s certainly a lobster, with the elongated body and the two large claws in front. But the walking legs are on the tail, four on one side and two (!) on the other. Its color a dirty grey. Let’s first compare it to Lauber’s effort. In my opinion, the Valenciennes lobster is a likely ancestor. Pay attention to the bowling pin shape, the 90° robot-like front arms, the placement of the legs on the tail. This means that there is some link between the c.1290 foundation of the Cantimpré tradition and the c.1440 Lauber lobster (and consequently also the lobster in Pal lat 1369). The Valenciennes Cantimpré is presumed to have resided from the beginning in the abbey of Saint Amand before being transferred to the nearby Valenciennes. I’ve mapped the route between the manuscript’s 15th century location and Haguenau (Lauber’s workshop) just for some geographical clarity – not to suggest an actual itinerary; there is no evidence of this particular manuscript to have moved from the Saint-Amands region, though its copies spread far and wide. Additionally, compared to the VM lobster, the Valenciennes example explains some elements which have been altered in Lauber. There’s four walking legs on one side – I’m not sure what happened on the other – and the tail has four smooth lobes. The lobsters on the left hand side appear to derive from the Valenciennes original, but clearly drift further away from a possible connection to the VM. The one middle right might also be similar. Note the hilarious leg placement on the one bottom right. It appears as though the copyist was dumbfounded by his example and put some legs everywhere just to be on the safe side. 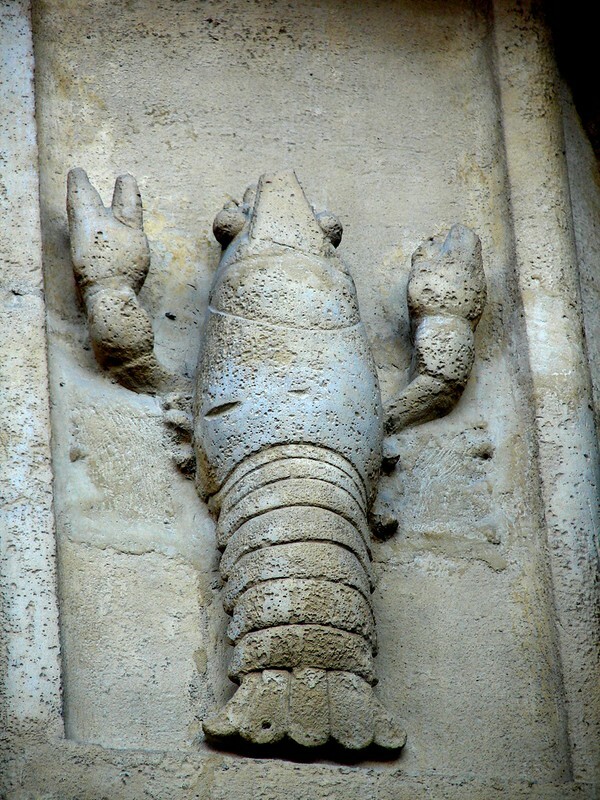 While the 13th and 14th century lobsters in the Cantimpré family have various colors and often face right, with the first half of the 15th century comes the arrival of the left-facing red lobster. The red VM lobster (included for reference) also faces left, but that’s likely a coincidence. Bottom right: Pal Lat 1066 (Bayern 1424). Left: Bohemian family. Unfortunately my questions remain mostly unanswered. I have shown that the specific lobster quirks which ended up in the VM very likely originated in the Valenciennes De Natura Rerum, but there is no clear path towards Lauber. The traditions of both Cantimpré and Scot did not offer a clear-cut anchor point for a VM branch. On the other hand, I do believe this investigation has made it more clear that some important source (important for VM purposes, that is) existed in ca. 1440 Germany. Pal. lat 1369 was already highly regarded among Voynich researchers, and it appears to postdate Lauber’s Scot by four to six years. Its lobster image belongs to the group of “canter” lobsters, characterized by concentric circles with red labels. The lobsters are all green-grey with the typical 90° front claws. Lauber’s lobster (which may be the earliest) is however the only one with legs on the tail and four lobes. It is also the only one which combines green and red, again like the VM lobster. Combining this information with the knowledge that the clothing of the VM Gemini, Virgo and archer were typical for the period 1400-1430, the hunt for early 15th century sources remains open. Thank you, Koen! The Valenciennes lobster is another excellent addition to the collection! Koen, Can you tell me how you managed to get a copy of Gatewood’s thesis?When I tried to get a copy, it wasn’t among the list of theses with the issuing university’s library. Nor could I find a contact online for Gatewood herself. Finally in desperation wrote to a mutual contact through academia, but still waiting for a response to that. Please tell how you did it. And I’m not sure what you’ll think, but this (linked below) looks to me like being one of those absent connections. Pity it has suffered damage. Michael Scot studied astronomy in Paris, but his Liber Introductorius was composed in Sicily, and is noticeably influenced by existing Sicilian, ‘Berber’ and North African traditions. Perhaps the hunt will have to consider a wider geographic range before settling on any ‘nationality’ for the type – not that you’ve done that!.